Three local wrestlers proved to have what it takes to be district champion. Kyler Pemberton of Mazama became champion winning the 106 lb weight class defeating Gabe Chaves of Hidden Valley 11-3. Klamath Union’s Isaiah Franco came out on top of the 126 lb weight class by defeating Asa Marwick of Hidden Valley 9-0. In the 285 lb weight class, Mikey Sierra of Henley had his hand held high after defeating Christopher Woods of Hidden Valley by pinfall, in 1 minute 33 seconds. 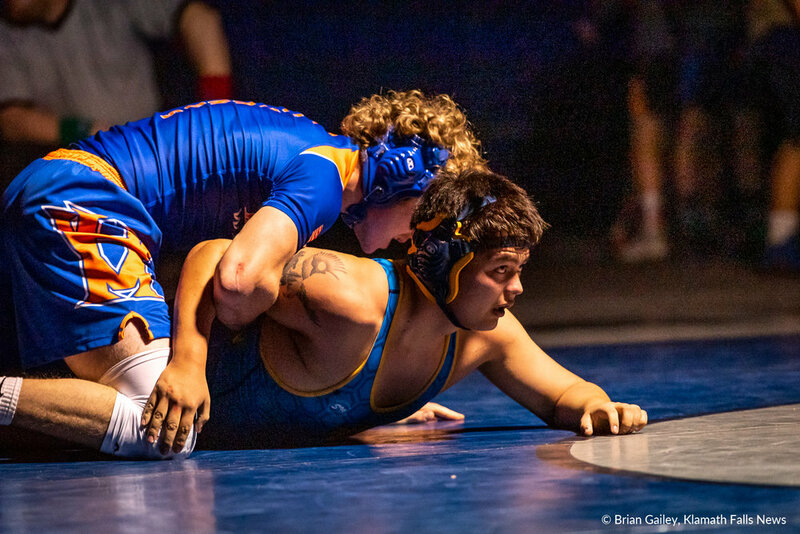 Mazama High School played host to the OSAA 4A Special District 3 Wrestling Tournament both Friday and Saturday this week. Over 130 wrestlers from schools in Klamath Falls, Grants Pass, Phoenix, Coos Bay, and Cottage Grove braved the snow covered slick roads to participate in the tournament. When the dust settled, and the spotlight was on, one athlete in each of the 14 weight classes would be district champion. The top four place finishers would qualify for state at the Rose Quarter on February 22-23, 2019. Championship match 285 weight class. Mikey Sierra (Henley) grapples Christpoher Woods (Hidden Valley). Sierra wins by pin.